It may have been a quiet month on this blog but I am back and have a new challenge: to make my way through as many of the Baileys Prize longlist as possible... This means lots of wonderfully talented female writers for me to discover and fills me with new excitement for my little online space. Without further ado, let's get to it. 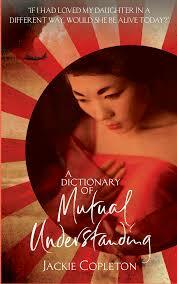 Here are my thoughts on Jackie Copleton's A Dictionary of Mutual Understanding. Copleton's novel is told from the perspective of Amaterasu Takahashi, an elderly Japanese ex-pat living in the United States, having moved there with her husband Kenzo after their daughter, Yuko and grandson, Hideo were killed in the bombing of Nagasaki. Having lived with her personal guilt regarding Yuko's death, she is confronted by a man claiming to be Hideo. As she struggles to accept this stranger she must deal with a history she has long been running from. It was surprising to me to discover that this is a debut novel as Copleton writes with such competence, building up a picture of Nagasaki before the destruction. As we hear of Yuko's first interaction with the older doctor, Sato and their subsequent meetings as he taught her to swim, it was hard not to be swept up in this young romance. Amaterasu confronts her daughter's diaries for the first time, and her version of events converges beautifully with Yuko's, providing two views on the same situation. Amaterasu herself is a fascinating protagonist, one who carries a great deal of shame at the life Kenzo rescued her from. As the story unfolds we come to understand her hatred towards Sato and the reason she acted so ruthlessly to ensure the couple ended their affair. The characterisation is where Copleton shines as she weaves in different voices. The use of Sato's letters to Yuko establish this 'villain' of the story as a sympathetic character, one who was forced to act in the most inhumane ways as a consequence of the circumstances of war, and someone who continued to regret the way things worked out. I finished the novel feeling that I really knew the characters and understood their motivations. More than anything this is a story about family and the human cost of the bombing at Nagasaki or pikadon as it is known to the Japanese. As I reached the end of the novel and Amaterasu returns to Japan, I felt the characters had earned the reconciliation afforded them. Amaterasu is finally able to forgive herself and accept the losses she experienced, though she will always carry them with her. This is a tender and compelling story and certainly deserving of its place on this year's Baileys Prize longlist. Thanks to the publishers at Hutchinson for providing me with a review copy of this via Netgalley.